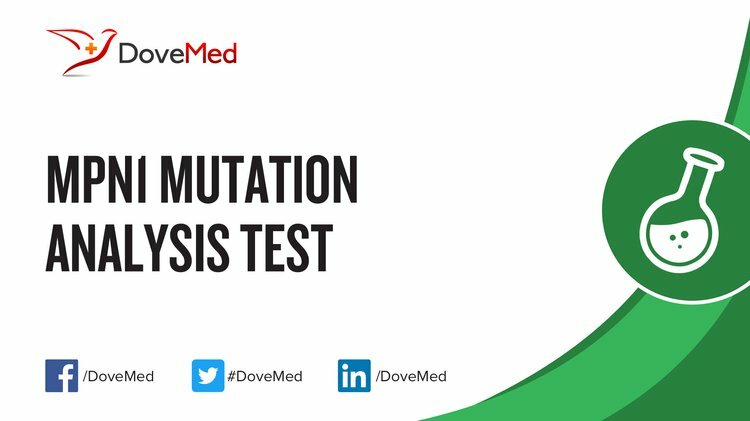 The MPN1 Mutation Analysis Test is a genetic test that helps detect abnormalities in the MPN1 gene. It is used to diagnose poikiloderma with neutropenia. What are the Clinical Indications for performing the MPN1 Mutation Analysis Test? How is the Specimen Collected for MPN1 Mutation Analysis Test? What is the Significance of the MPN1 Mutation Analysis Test Result? Makishima, H., Jankowska, A. M., McDevitt, M. A., O'Keefe, C., Dujardin, S., Cazzolli, H., ... & Shaik, M. (2011). CBL, CBLB, TET2, ASXL1, and IDH1/2 mutations and additional chromosomal aberrations constitute molecular events in chronic myelogenous leukemia. Blood, blood-2010. Tefferi, A., Jimma, T., Sulai, N. H., Lasho, T. L., Finke, C. M., Knudson, R. A., ... & Pardanani, A. (2012). IDH mutations in primary myelofibrosis predict leukemic transformation and shortened survival: clinical evidence for leukemogenic collaboration with JAK2V617F. Leukemia, 26(3), 475-480. Shchepachev, V., Wischnewski, H., Missiaglia, E., Soneson, C., & Azzalin, C. M. (2012). Mpn1, mutated in poikiloderma with neutropenia protein 1, is a conserved 3′-to-5′ RNA exonuclease processing U6 small nuclear RNA. Cell reports, 2(4), 855-865. Jekarl, D. W., Han, S. B., Kim, M., Lim, J., Oh, E. J., Kim, Y., ... & Han, K. (2010). JAK2 V617F mutation in myelodysplastic syndrome, myelodysplastic syndrome/myeloproliferative neoplasm, unclassifiable, refractory anemia with ring sideroblasts with thrombocytosis, and acute myeloid leukemia. The Korean journal of hematology, 45(1), 46-50. Flach, J., Dicker, F., Schnittger, S., Kohlmann, A., Haferlach, T., & Haferlach, C. (2010). Mutations of JAK2 and TET2, but not CBL are detectable in a high portion of patients with refractory anemia with ring sideroblasts and thrombocytosis. haematologica, 95(3), 518-519. Muendlein, A., Gasser, K., Kinz, E., Stark, N., Leiherer, A., Rein, P., ... & Lang, A. H. (2014). Evaluation of the prevalence and prospective clinical impact of the JAK2 V617F mutation in coronary patients. American journal of hematology, 89(3), 295-301.